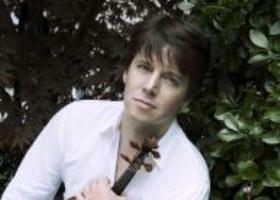 Aside from having international superstar status among classical musicians, violinist Joshua Bell maintains a loyal following in Philly that goes way back to his debut, at 14, with Riccado Muti and the Fabulous Philadelphians. But, it seems obvious that he is game for more than marquee stardom. In April, Bell was back in Verizon Hall, appearing with the Academy of St. Martin in the Fields to finish out the Kimmel Center’s Great Orchestras series. Since last year, Bell has been director of the revered chamber orchestra with founder Sir Neville Marriner. Sir Neville, now 88, imparts a towering legacy in passing the baton. Bell’s conducting style, like his playing, is aggressive, controlled and detailed. Part of Bell’s appeal as a soloist is his expressiveness, and he didn’t tamp any of that down, even as he lead the orchestra, old style, from the first violin chair for Mozart’s Symphony No. 25. While playing, he rocked back and forth and pitched himself forward to cue orchestra accents. The Academy has so much ensemble luster and drive, and Bell instantly summoned brisk, striated tempos, fluid wind-string interlocks and deep contours of the lower strings. Among the standout players were Christopher Cowie’s soulful oboe. Next was Bell’s virtuosic turn in Max Bruch’s Violin Concerto No. 1, composed in 1866, with Bell composing the cadenzas himself. He looked a little sweaty coming off some of these dense solo passages, dramatically lunging at the players for the hand-offs. His solos were mostly fevered and expanding the modern aura of the piece. Bell’s technical dexterity was on fabulous display in the sharp contrasting moods in the piece. The concert finished with Beethoven’s Symphony No. 4, here gushing forth in Baroque chamber orchestra grandeur, highlighted by a lot of outstanding passages, but Adrian Bending‘s one-man timpani was no less than Ludwig epic. Bell’s tour with the Academy coincides with the release of “French Impressions” and a collaboration with pianist Jeremy Denk. The duo is completely authoritative with synergized impressions of Camille Saint-Saëns, Cesar Franck and Maurice Ravel. This is also an exploration of the sonata form, but hard to tell if they are editorializing, or just reveling in the playing of these composers. Past the intoxicating musicianship, there is such immediacy and intimacy of this recording that you feel as if you were at the session, both classical heavyweights looking to neutralize that stardom in service of this music.